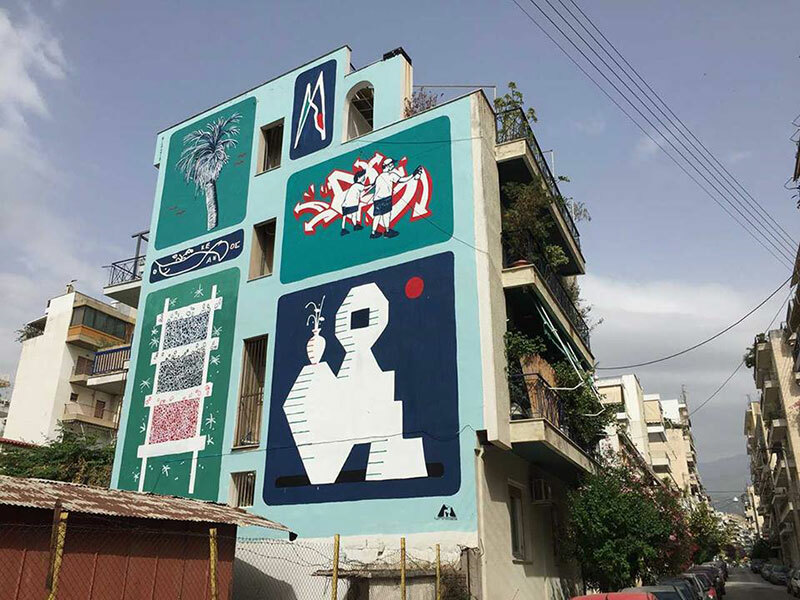 MA Communication Design graduate and graffiti street artist Bilos Mantho has been commissioned to paint a mural in his hometown in Greece as part of a growing festival called ArtWalk. Bilos, who graduated from MA Communication Design in 2015, returned to Patras to paint Reminder, a 12 metre by 10 metre mural. The piece features a palm tree – one of the few remaining ones in the neighbourhood – train tracks next to the wall but soon to be moved underground, and a photo of the artist and his late friend Ernesto, painting graffiti at the age of 13. “It is painted in the neighbourhood where I grew up and made my first tags and graffiti,” said Bilos. “It is a tribute to my childhood memories and the neighbourhood itself. “The title Reminder is chosen as I would like this piece to serve as a reminder to the public of what this neighbourhood once was, but also as a personal reminder of what it means to me. Bilos said that his forthcoming work includes a design for a capsule collection for a clothing brand from Mexico due to be released in August.